Newfane Common is considered by many to be the most picturesque New England common, and it is certainly one of the most photographed. Standing on Route 30 and looking west, the Common is dominated by the Windham County Court House. To the left (south) is Union Hall. To the west is the Meeting House of the First Congregational Church. The Town of Newfane (or township as it would be known in other parts of the country) was chartered in 1753 by Benning Wentworth, Governor of New Hampshire. Jonathon Park was the first settler in 1766, clearing land on Newfane Hill not far from the original town center, now near the intersection of Newfane Hill Road and Otis Lane. In 1787, Newfane became the shire town (or county seat) of Windham County. About 1824, the shire was moved from Newfane Hill to Fayetteville (now Newfane Village), probably because travel was easier along the West River Valley, thus enabling easier access to the county buildings. Many of the buildings from the village on Newfane Hill were moved by oxen to the new village location. The first two buildings erected on the common were the court house and the jail. What remains of the original jail complex (including the jail, an inn, barns and shed) is to the east of Route 30 and is the office of the Windham County Sheriff. The stately Windham County Court House in the center of the Common is the culmination of several building phases. Originally it was a federal-style building with a symmetrical boxlike shape; the federal-style is retained in the entranceway. Many changes were made to the Court House in its early years, with the most dramatic being in 1854 when the two story, Greek revival portico was added with the four majestic Doric columns. Finally, in 1907, the building was extended westward with the addition of two bays. The Court House was renovated and restored a few years ago, and continues to serve the judicial needs of Windham County. To the south of the court house is Union Hall. 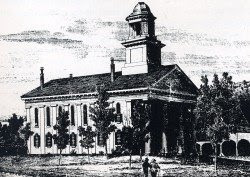 This building began as a “Union Church” in 1832. Five Christian Sects (Congregationalist Restoration Order, Calvinistic Order, Methodist, Unitarian, Baptist) joined together to build this meeting house. The Fifty-two pews were auctioned, and the number of pews purchased by each sect determined the number of Sundays that sect would have the pulpit each year. In 1838, the dominate Congregationalists withdrew from the union and built the church at the west end of the Common. Worship continued in Union Hall until 1854. The building then sat empty until 1872 when the village took over the building,. It was restored and remodeled. Now with a stage instead of pulpit and pews, the building was a regular venue for dramatic productions, dances, concerts, and meetings. This use continues to the present. Surrounding the Newfane Common are two country inns noted for their hospitality and fine dining, a general store and country store supplying essentials to the community and its many visitors, and private dwellings (some of which began their lives on Newfane Hill). During the summer, the Newfane Business Association sponsors free concerts on Wednesday evenings on the Common. Residents, neighbors, friends, and visitors gather for music, often a picnic supper, and always a pleasant time. The first Sunday evening in December is "Winterfest," also sponsored by the NBA. Santa visits, and the Common is lit for the winter holidays. 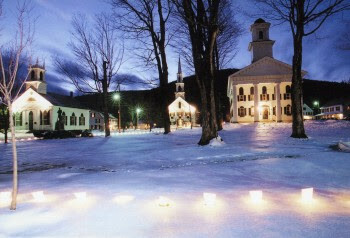 There is a soup supper in the Congregational Church, followed by a holiday program. 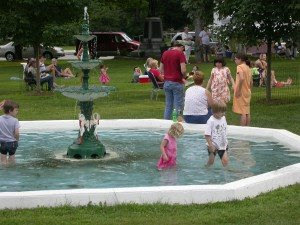 Other school and community groups hold occasional sales, craft shows, and events on the Newfane Common, but the premier event during the year is the Newfane Heritage Festival. Come anytime and enjoy the common public space of this beautiful New England common. Come on Columbus Weekend and experience the hospitality of a New England craft fair. 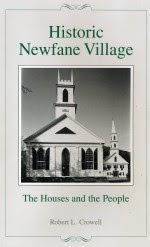 More information about the Common and the Village can be found in Historic Newfane Village by Robert L. Crowell (available at Moore Free Library, the Windham County Historical Society, and Olde and New England Books). Available at the library and historical society is Newfane’s First Century, the centennial proceedings published in 1877. More Photosfrom our "Party on the Common"
This site is owned by First Congregational Church of Newfane, Vermont.